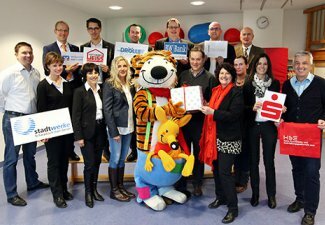 The Helmut Hachtel GmbH is committed to regularly financially support need and ill children and youths in our region! Benefizkonzert zu Gunsten des Sonnenhofs e.V. 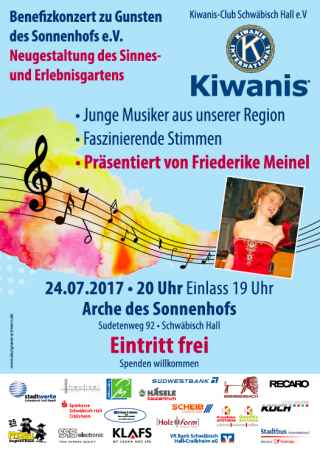 Am 24.07.2017 veranstaltete der Kiwanis-Club Schwäbisch Hall ein Benefizkonzert. Junge begabte Musiker aus unserer Region traten auf und zeigten ihr Talent und Können. 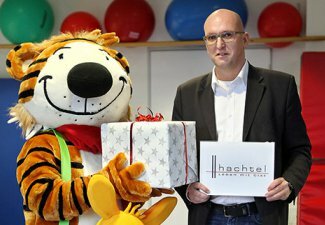 Zusammen mit dem Kiwanis Club Schwäbisch Hall unterstützte die Helmut Hachtel GmbH als einer der Sponsoren dieses Projekt! Christmas without a visit to the christmas circus in Heilbronn is inconceivable for many families. For children, this circus is particularly special, but also for adults this circus has been a highlight in the event calendar for many years. With their project "Zirkuspalast" the Kiwanis Service-Klubs of the region could again enable free entrance to the show for 2000 children and youths with their guardians, a trip that otherwise might not have been possible for them. Enabling a visit for so many children enriches this event and makes it something very special for the families, the city, and the entire region. The children get the chance to spend a few hours of carefree fund with clowns, impressive stage shows and exciting animal acts, helping them to escape the everyday life for a few fun-filled hours. The Helmut Hachtel GmbH is a proud sponsor of the "Zirkuspalast 2016" in Heilbronn.